Ozone (O3) in the troposphere, acts as an efficient cleansing agent, but at high concentration it also becomes harmful to the health of humans, animals, and vegetation. Downward transport of ozone from the stratosphere contributes to the tropospheric ozone abundance, but ozone is also produced in the troposphere by sunlight driven chemical reaction cycles by the emissions of nitrogen oxides and hydrocarbons resulting in an increase of ozone near the surface (‘summer smog’) and a degradation of air quality on a global scale. As such, it is important that TROPOMI will provide a separate data products focusing on the tropospheric ozone concentration. There are many techniques that can be employed including the ozone profile retrieval, the Convective Cloud Differential (CCD), and the Cloud Slicing (CS) methods. The CCD and CS algorithms focus on the tropical band (20°S to 20°N) where a significant impact of climate change on the tropospheric ozone is expected. 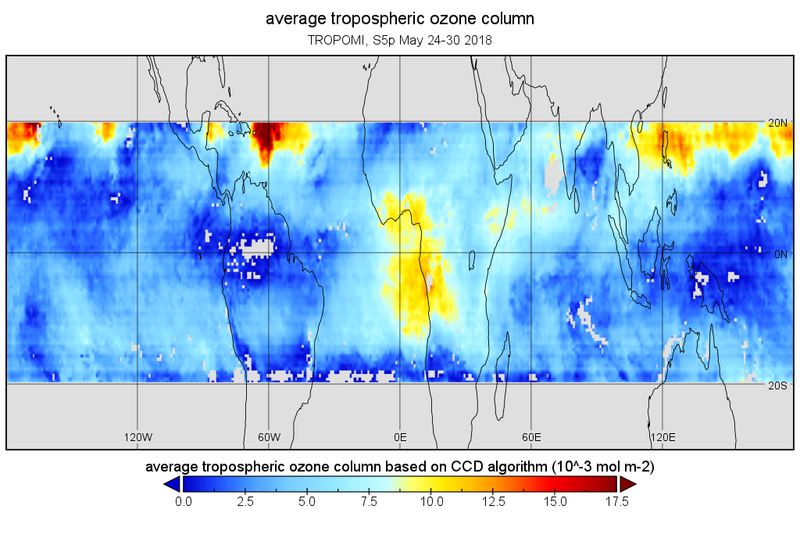 Here an example of the S5P tropospheric column data for end of May 2018 is shown.